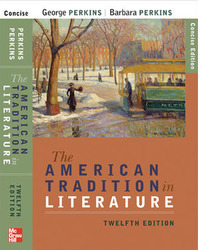 Widely known as the anthology that best unites tradition with innovation, The American Tradition in Literature is proud to enter its fifth decade of leadership among textbook anthologies of American literature. Each volume continues to offer a flexible organization, with literary merit as the guiding principle of selection. The new photos and illustrations illuminate the texts and literary/historical timelines help students put works in context. A revised table of contents that adds dates for literary periods and clarifies thematic groupings. New writers, including John James Audubon, Alexander Falconbridge, Al Gore, Francis Higginson, Jack Kerouac, Norman Mailer, Sarah Morgan Bryan Piatt, Jane Johnston Schoolcraft, and John Edgar Wideman. Organization honors both history, under headings such as Exploration and the Colonies and The Second World War and its Aftermath, and thematic clusters that include The Romantic Temper and Poets of Idea and Order. Beneath each divisional heading, our arrangement is generally chronological according to the authors’ birth dates. Reliable Scholarship. Biographical introductions are carefully crafted to provide students with an overview of the life and work of each writer, without attempting to forward any single reading or perspective. Historical introductions, headnotes, and footnotes are scrupulously checked and updated to maintain factual accuracy and to provide an objective overview of periods, lives, and works. Revisions of the general bibliography at the end of the volume ensure its continued value as a guide to reliable sources of information. Literature in Context. The American Tradition in Literature helps students to find their bearings through introductions that shed light on the historical, social, and cultural contexts in which the literature was produced. Timelines place literary works in their historical context, and the Crosscurrents provide brief, pointed excerpts that help to illuminate major periods and ideas, each resonating against other selections within the book. The intent of these sections is to awaken the reader’s curiosity, stimulate further exploration, and provide subjects for class discussion, essays, and term papers. Additional Readings Available. Instructors who want to supplement this text or design their own American literature book may want to turn to Primis, a McGraw-Hill online resource with hundreds of authors and thousands of selections that may be selected, printed and bound for classroom use. Among an extensive range of titles offered by Primis online are Toni Cade Bambara’s “The Lesson” and “Gorilla, My Love,” Black Elk’s “High Horse Counting,” Richard Rodriguez’s “Aria: A Memoir of a Bilingual Childhood,” and Diane Wakoski’s “You, Letting the Trees Stand as My Betrayer.” All selections are accompanied by biographical introductions and footnotes. Visit www.primisonline.com for more information. Chapter VII [Learning to Read and Write]. Picking Blueberries, Austerlitz, New York, 1957. George Perkins is Professor of English at Eastern Michigan University and an Associate Editor of Narrative. He holds degrees from Tufts and Duke universities and received his Ph.D. from Cornell. He has been a Fulbright Lecturer at the University of Newcastle in Australia and has held a Fellowship at the Institute for Advanced Studies in the Humanities at the University of Edinburgh. In addition to Newcastle and Edinburgh, he has taught at Washington University, Baldwin-Wallace College and Fairleigh Dickinson University. His books include THE THEORY OF THE AMERICAN NOVEL, REALISTIC AMERICAN SHORT FICTION, AMERICAN POETIC THEORY, THE HARPER HANDBOOK TO LITERATURE (with Northrup Frye and Sheridan Baker), THE PRACTICAL IMAGINATION (with Frye, Baker and Barbara Perkins), BENET'S READER'S ENCYCLOPEDIA OF AMERICAN LITERATURE (with Barbara Perkins), KALEIDOSCOPE: Stories of the American Experience (with Barbara Perkins), WOMEN'S WORK; An Anthology of American Literature (with Barbara Perkins and Robyn Warhol), and THE AMERICAN TRADITION IN LITERATURE, 9TH edition (with Barbara Perkins). Barbara Perkins is Adjunct Professor of English at the University of Toledo and Associate Editor of Narrative. Since its founding, she has served as Secretary-Treasurer of the Society for the Study of Narrative Literature. She received her Ph.D. from the University of Pennsylvania and has taught at Baldwin-Wallace College, The University of Pennsylvania, Fairleigh Dickinson University, Eastern Michigan University, and the University of Newcastle, Australia. She has contributed essays to several reference works including CONTEMPORARY NOVELISTS, GREAT WRITERS OF THE ENLGISH LANGUAGE, and THE WORLD BOOK ENCYCLOPEDIA. Her books include CONTEMPORARY AMERICAN LITERATURE (with George Perkins), BENET'S READER'S ENCYCLOPEDIA OF AMERICAN LITERATURE (with George Perkins and Phillip Leininger), KALEIDOSCIPE: Stories Of the American Experience (with George Perkins), WOMEN'S WORK: An Anthology of American Literature (with George Perkins and Robyn Warhol) and THE AMERICAN TRADITION IN LITERATURE, 9th edition (with George Perkins).